Oak trees (Quercus spp.) rarely require pruning. 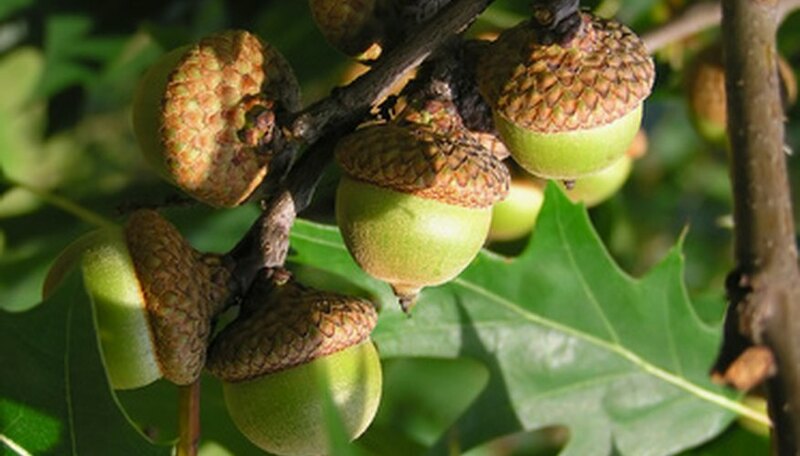 But if your tree needs maintenance, do so when the risk of oak wilt disease is at its lowest. Sap beetles are carriers of the deadly oak wilt fungus and are attracted to fresh wounds on oak trees. The University of Minnesota Forestry Department posts the oak wilt risk levels for pruning oaks: high risk in April through June, low risk in July through October, and no risk in November through March. You can safely prune Minnesota oaks in winter and take appropriate precautions as needed to protect the health of your tree. Choose the appropriate tool. A hand pruner or lopper cuts branches up to 1/2-inch thick; a pole or tree saw is appropriate for branches up to 3 inches; and a chain saw is best for larger limbs. Oak trees are hardwoods and require considerable effort to cut. Follow all safety precautions for the tool you chose. Wear safety glasses. Bits of bark, sawdust and debris fly around as you cut. Use a pole saw if the cut is above your head. Ladders are not a safe choice when pruning a tree because they are unstable and hinder quick movements. If the pruning need is above pole saw height, use appropriate tree climbing equipment or hire a qualified tree service. Locate the branch collar. Tissue builds up to pass nutrients around the branch and up the trunk, much like a river flowing around an island. Damage to the collar will compromise the health of the tree. Make the first cut. If the branch is tiny, cut right next to the collar. If the branch is more than 1/2-inch diameter, saw through the bark under the branch an inch or so beyond the collar. This undercut prevents the bark from ripping as the branch falls. Make the second cut on the top of the branch, a bit past the undercut. Position yourself on the tree side of the cut for safety. Saw all the way through the branch, making sure the falling branch will not damage property, pets or people. Make the third and final cut next to the collar. Do not leave a stump but take care not to damage the collar; the tissues of a stump will decay and invite disease into the main truck of the tree. Cover the cut with latex tree paint only during spring or summer to prevent the oak wilt prevalent in Minnesota at that time. Pruning cuts heal naturally without paint when the tree is dormant, the safest time to prune oaks. Plant new trees an appropriate distance from buildings to prevent unnecessary pruning. Take note of the specified mature tree width for guidance and allow the oak tree to develop its natural shape. Crown thinning is appropriate when the tree is young and dormant or after suffering storm damage. Prune off lower branches when the tree is young and dormant. Raise the lowest scaffold branches to 10 feet or more when the tree is 15 to 20 feet tall. Do not plant oak trees under power lines.